Click on a screenshot to see details. 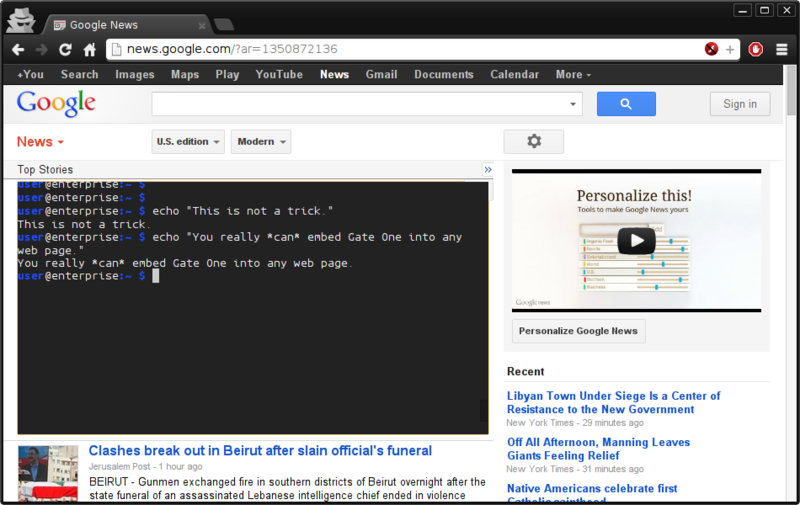 Gate One™ is a web-based Terminal Emulator and SSH client that brings the power of the command line to the web. It requires no browser plugins and is built on top of a powerful plugin system that allows every aspect of its appearance and functionality to be customized. Upgrades happen in one place. A single Gate One server can handle thousands of users and each user can have as many open terminals as they like. 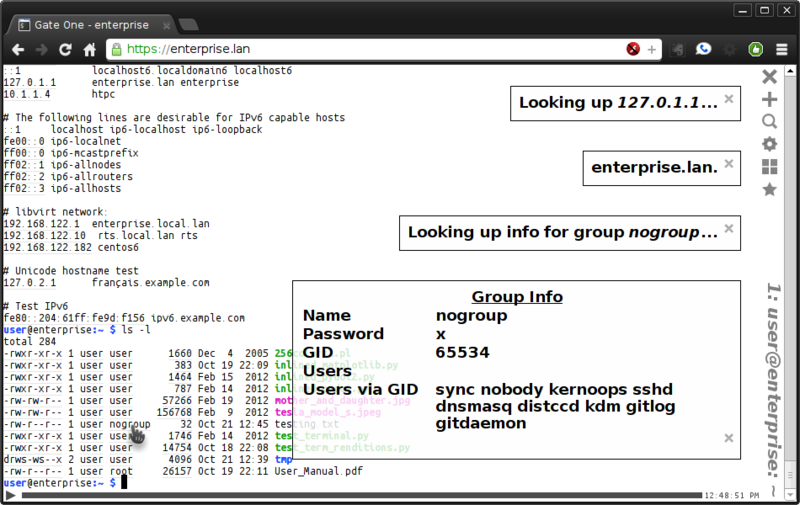 Gate One supports Single Sign-On (SSO) with Kerberos and Active Directory. It also supports Anonymous, PAM, Google, and it's own API-based authentication methods (for pass-through authentication when embedding). Unlike traditional web-based applications Gate One can be running on one server while being embedded into another--even from different domains. It can do this thanks to the power of WebSockets which don't have the cross-origin limitations of technologies such as AJAX. Network disruptions are no problem for Gate One. You can completely close your browser and pick up where you left off from anywhere; even from a different computer. The number of web-based applications that don't work properly with copy & paste is astounding. Gate One doesn't just do copy & paste; it works so well you won't have to think about it. You don't need Flash, Java, or ActiveX to use Gate One thanks to the power of HTML5. All you need is a modern browser. It even works in Internet Explorer. 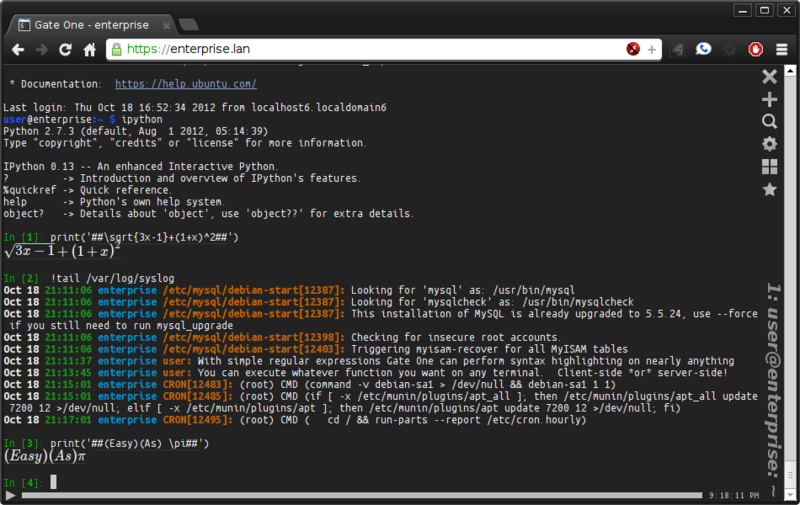 Have you ever wished you could go back in time with your terminal session to see what was on the screen a moment ago? With Gate One you can: The Playback plugin provides the ability to rewind your terminal session on-demand just like a video without having to open a log file. Gate One supports SSL and TLS encryption out of the box and you'll never have to worry about it falling behind thanks to the high level of abstraction. Upgrade OpenSSL and you'll have upgraded Gate One right along with it. You won't even have to re-install or recompile anything. Central to Gate One is its logging capabilities: If it isn't a keystroke it will be recorded by default. 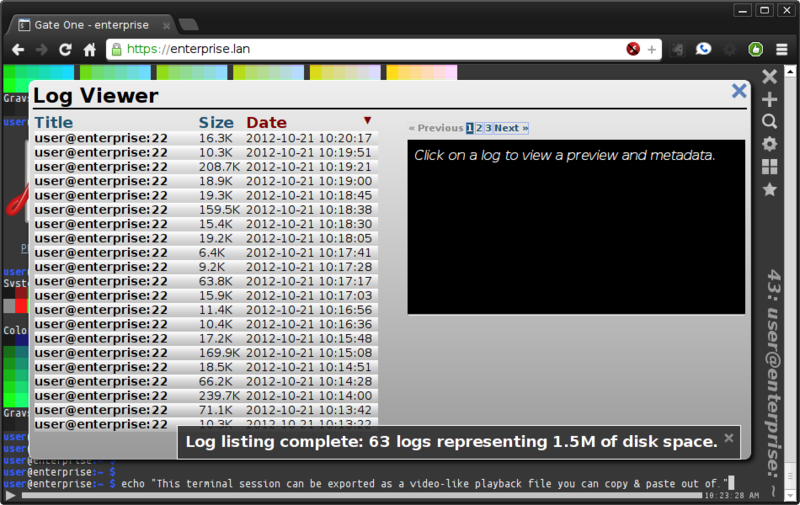 Logs can be viewed flat (printable) or played back in real-time like a video. Users can access their own logs and export them to self-contained HTML playback files. You can even copy & paste out of them (something you can't do with a video). Of course, Gate One also supports logging to syslog (local or remote). Gate One is both open source and very popular. Providing the ultimate combination of trustworthiness and security. 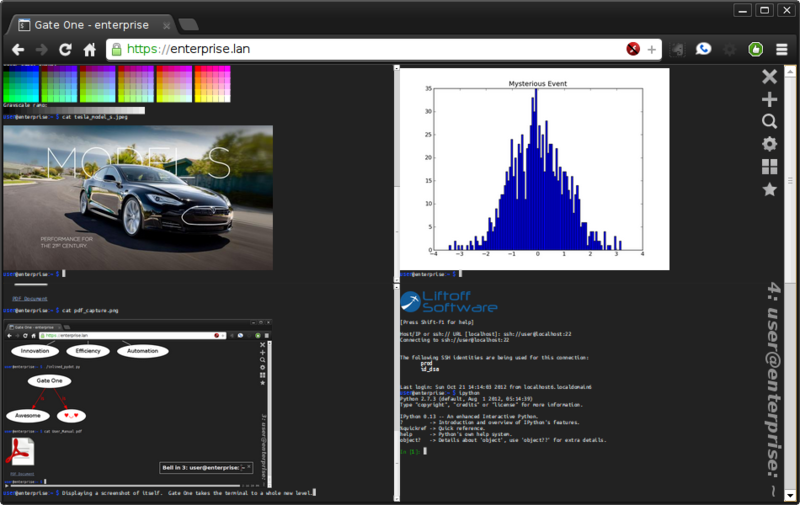 Some web-based terminals are oddly restricted to terminal sizes of 24x80 or 27x132. Gate One has no such limitation: It automatically calculates how many rows and columns will fit within your browser; even when you resize the window. Of course, if you need it this behavior can be overridden to set whatever number of rows and columns you desire. 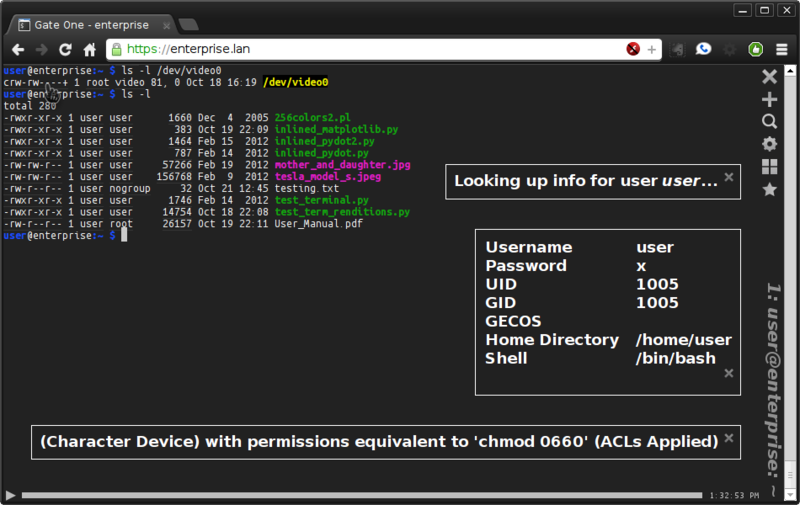 By default Gate One acts as a powerful SSH (and telnet) client but you can run any terminal application you want. Run your own software, nethack, lynx, vim, whatever. Gate One is application agnostic. Gate One is unique in its ability to display images and PDFs inline within terminals. You can literally type 'cat image.png' and Gate One will display it in your terminal. It isn't limited to the 'cat' command either: Send whatever you want to standard output and Gate One will automatically detect and display it for you. It even works with PDFs and support for additional file types is easy to add. Gate One is currently running some of the world's fastest supercomputers while at the same time it's shipping on thousands of tiny embedded devices. If you don't include the extensive documentation Gate One is only about 5 megabytes. When run with 'dtach' support enabled, the Gate One daemon can be stopped & started without users losing their connected sessions. This means that when you upgrade Gate One your users will face at most 5 seconds of down time when their browsers are forced to reconnect; they can pick up right where they left off. Every aspect of Gate One supports IPv6. From listening on IPv6 addresses to making outbound IPv6 connections. Even the Conveniences plugin supports IPv6: Displayed IPv6 addresses become links that perform DNS lookups when clicked. Want to try out Gate One? Just press your ESC key or click here to connect directly to a demo server (It isn't working? ).